Find and deliver some forged documents to the Imperials. Get your orders from Galmar. Locate the courier at Four Shields Tavern or Frostfruit Inn. Retrieve Imperial documents from him. Return them to Galmar Stone-Fist. Take the forged documents to Legate Taurinus Duilis in Morthal. 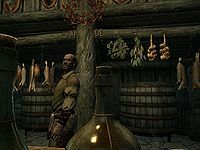 Galmar Stone-Fist will tell you that you need to deliver false orders to an Imperial Legate in Morthal but first you intercept and steal plans from an Imperial courier. He tells you that Dragon Bridge and Rorikstead are frequented often by Imperial couriers, and you should look in the inns of those places. Head to Rorikstead or Dragon Bridge and speak to the innkeeper in the local inn. To find out the courier's location, you must either persuade, bribe, or intimidate the innkeeper. His life is in danger. (Persuade) Passed: It is? Well that's different. "His life is in danger." "It is? Well that's different." The innkeeper will then tell you that the courier just left, so you could go after them, or you can wait for the courier to come back. It's better to find the courier in the wilderness because you will get a bounty for killing them. The courier may be far from town, so you it might be better to wait for them to come back and then follow them out of the town. Once you find the courier, saying you want the documents will make the courier attack you immediately.You may also pickpocket the documents off of the courier. The courier may also get into a fight with Stormcloaks or wild animals. Stormcloaks and hostile bandits often frequent the courier's route. Once you have the documents, head back to the Stormcloak camp and give them to Galmar. He will then forge false information and will then tell you to take them to the Legate in Morthal. Head to Morthal and enter the Highmoon Hall, the Legate is through the doorway, under the stairs, to the left. Talk to him and give him the documents, if you are not wearing a Legion uniform he will ask about it, but upon explaining yourself he will take the documents and give you five gold. Now report back to Galmar to prepare for the Battle for Fort Snowhawk. This quest and A False Front (Imperial) are different radiant versions of the same quest. Since Rorikstead is in Whiterun hold, which has already been conquered by the Stormcloaks, you can simply wait for him to show up there and watch the Stormcloak guards slaughter him. When you speak to the courier demanding the documents he will become hostile and attack you, but killing him will still count as a murder. The easiest way to avoid the murder charge is to get a little in front of him on the road and trigger the bandits hostilities at Robber's Gorge. They usually capably dispose of him. Without your character triggering the bandit ambush he usually makes his trips unharmed. Be careful about entering Frostfruit Inn to confront the courier while he is in there. He will usually be sleeping in the right hand room when you enter, and when he rises will stand up on the wrong side of the bed causing him to clip through the wall and even fall off the map. To fix this, wait 1 hour in the inn. The courier will then jump to the other side of the bed allowing you to continue with the game as normal. 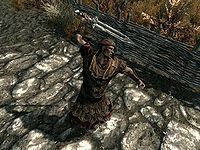 Killing the Imperial courier will count as murder, even if he attacks you first. If a nearby NPC witnesses your "murder", you will incur a bounty in Hjaalmarch, Haafingar, or Whiterun Hold. 10 Galmar Stone-Fist has sent me to intercept the Imperial Courier passing through the area and relieve him of his documents. I am then to return to base camp where I will receive forged documents that I, posing as an enemy courier, will deliver to the enemy commander in Morthal. The following empty quest stages were omitted from the table: 0, 15, 31, 39, 51, 100, 255. On the PC, it is possible to use the console to advance through the quest by entering setstage CWMission03 stage, where stage is the number of the stage you wish to complete. It is not possible to un-complete (i.e. go back) quest stages, but it is possible to clear all stages of the quest using resetquest CWMission03. This page was last modified on 4 April 2019, at 17:43.